I got a book from the library a few weeks ago called Thanks for the Feedback – the art and science of receiving feedback well by Douglas Stone and Sheila Heen. Feedback? You probably want to stop reading right now, don’t you? Or offer some…ahem..feedback? The funny thing was when I opened the book, the book jacket was on backward and upside down. I wondered for a moment if this was a librarian’s joke (our librarians have a great sense of humor- and I speak from personal experience here). Was I supposed to figure out how to give them feedback about the book? But here’s the thing that makes this a great read – it’s that one extra word in the title: receiving. The bottom line here may be that it really is all about you. How do you manage feedback? Because if every conflict has at least two parties, and you’re one of them, then you know which one you might stand half a chance of managing, right? The book got me to think about how we use feedback at work and how fraught with conflict it often is. And outside work, we are always getting and sending messages to our friends and family. Most of us really want some real information about how we’re doing, but it can also be hard to hear what usually sounds like criticism. I recommend reading the book if you’re looking for a really thorough study of the art of receiving feedback with lots of how-to examples. But here’s a specific aspect of feedback that can help reduce conflict. How specific are we being? When a performance review, for instance, says “great job!” it’s hard to know what about your work was valued. The lack of specificity may even make us doubt that our supervisor knows what our work actually entails. They haven’t given us any clues to go by. Was it my presentation style? My written report? My interaction with a team? My supervisory skills? When we’re trying to grow or develop a new talent or skill, we’re especially interested in knowing how we’re doing. 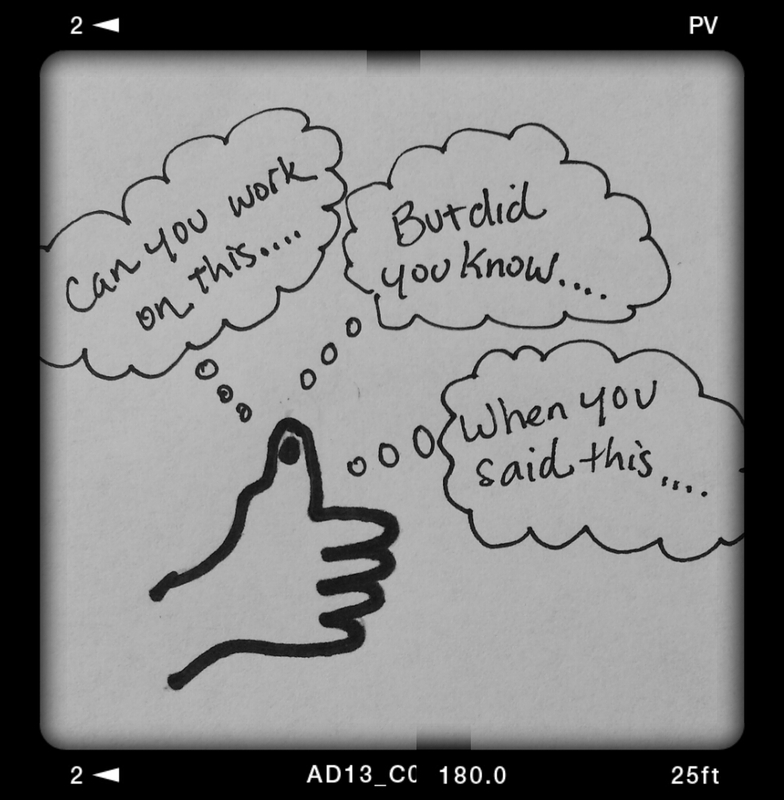 Specificity in feedback can reduce misunderstandings and conflict. When we’re giving feedback, we can reduce confusion and increase clarity by sharing our observations in detail. Great job at this morning’s meeting. Let’s hit the deadline. At this morning’s meeting, you said (insert quote of that thing they really said – not a paraphrase – this may require you to jot down some notes occasionally). I was pleased because it showed an understanding of the group’s assignment and you were asking for others to contribute to the project (I’m making this up, but you get the idea – why is what they did important?). It’s important to get this project done on time and I appreciate your efforts to include everyone in the room. Do you need anything else to meet the deadline? That’s an example of how to give feedback though. What if you’re on the receiving end of the first type of feedback? You may try to ask for the specific information you need. Supervisor: Great job at this morning’s meeting. Let’s hit the deadline. Awesome. Except I have no idea what was great. I was trying to manage three conflicting personalities in the room and my kid might be coming down with a cold and I kept hoping the school wouldn’t call in the middle of the meeting. And, by the way, I’m nervous about this new project. You: Thanks, I know the deadline is important to you. Can you share a little more about what you observed this morning that was successful? That might help me better understand what you’re looking for. This is a new type of project for me and I’d like to be able to meet your expectations. Supervisor: No worries, you’re doing great, just keep doing what you’re doing. Okay, s/he’s getting a little irritated. Maybe they were not really paying attention during the meeting? How can I reframe a check-in as being in their best interest? And perhaps model some of what I’m looking for? You: Thanks, I know you have some high expectations here and it would help me to spend a few minutes sharing what I think is working and what our next steps are – maybe we could check in for 5 minutes later today? I’ll bring some specific questions so we can keep it brief. Supervisor: Okay, sure, 5 minutes. Ack! I wonder if I have time to run to the library, get that book, read it all and use it…..haha. Okay, what am I really after in this conversation? And I’d better arrive prepared with specific observations and questions that can be handled in 5 minutes. Now it’s back in your court. The conflict in this particular situation is internal. You’re looking for information, guidance, direction, and your supervisor isn’t giving it. Maybe by modeling the specific interaction you’re after, they’ll be able to give you what you need. If you’re lucky enough to have employees who are asking for feedback, Thanks for the Feedback – the art and science of receiving feedback well by Douglas Stone and Sheila Heen. is a good resource. Taking the sting out of giving – and hearing – feedback can reduce a lot of workplace tensions. Do you have examples of how you’ve tried this? ← Is your inability to delegate holding you (and everyone else) back? at work so I decided to browse your website on my iphone during lunch break. .. I’m not even using WIFI, just 3G .. Anyways, good site!